A pair of baggy trousers gathered at the ankles and worn with a short-belted tunic was sported by Amelia Jenks Bloomer of Homer, New York in 1851. She had copied the pants costume from a friend, Elizabeth Smith Miller. But it was Mrs. Bloomer, an early feminist and staunch supporter of reformer Susan B. Anthony, who became strongly associated with the masculine-type outfit that it acquired her name. Pants, then men’s wear, appealed to Amelia. She advocated female dress reform on the grounds that the large-hoop skirts of her day were immodest, drafty and cumbersome, not only to maneuver in, but to take care of bodily functions. Matters were made worse by the stiff linen and horsehair crinoline in vogue in the 1840s, worn to exaggerate the femininity of the dress. She refused to wear the popular fashion. As more women joined in to the fight for the right to vote, Mr. Bloomer turned the trousers into a uniform of rebellion. The pants trend received additional impetus from the bicycle craze of the 80s and 90s. 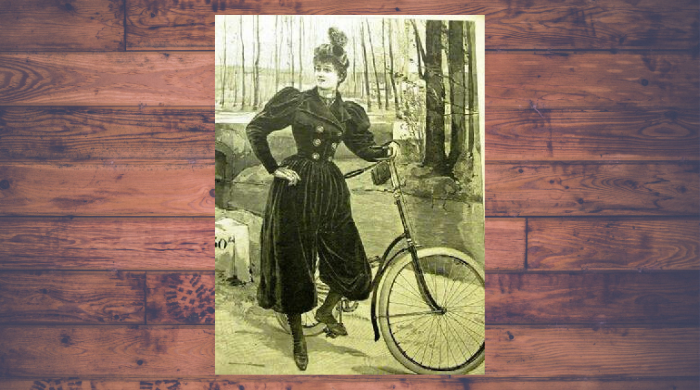 Skirts frequently caught in a bike’s cogs and chains, resulting in minor or serious accidents. Bloomers became ideal riding attire, challenging the long tradition of who in the family wore the pants.